Professor Tsai's research interests include human genetic disorders, cancers, and microbial genomics. His laboratory has applied genetic mapping and genomic technology to identify genes associated with human diseases. Using high-throughput genotyping, sequencing, and microarray methods, his laboratory has investigated the genetic basis of liver cancer and lung cancer. Professor Tsai has led several genome sequencing projects on bacterial pathogens, including Vibrio vulnificus and Klebsiella pneumoniae. The genomic information can help understand the evolution of microbial organisms and the molecular basis of bacterial virulence and antimicrobial resistance. Professor Tsai has helped the establishment of genome research facility at the National Yang-Ming University and the National Health Research Institutes. His team has pioneered in Taiwan the whole-genome sequencing of a biological organism and championed in genomic studies of Vibrio vulnificus and Klebsiella pneumoniae. He has led the successful identification of two Col2A1 gene variants responsible forthe autosomal dominant form of osteonecrosis of the femoral head. His team also discovered high frequency and complex pattern of the Epidermal Growth Factor Receptor gene mutation in adenocarcinoma of the lung in Taiwanese patients and conducted de novo sequencing and SNP discovery projects for the chromosome 4q region implicated in hepatocellular carcinoma oncogenesis. 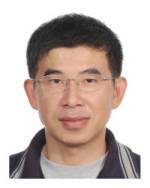 Professor Tsai has authored more than 60 peer-reviewed papers in the fields of genetics and genomics. Su JS, Tsai TF, Chang HM, Chao KM, Su TS, Tsai SF. Distant HNF1 site as a master control for the human class I alcohol dehydrogenase gene expression. J Biol Chem. 281:19809-19821, 2006. Liu YF, Chen WM, Lin YF, Yang RC, Lin MW, Li LH, Chang YH, Jou YS, Lin PY, Su JS, Huang SF, Hsiao KJ, Fann CS, Hwang HW, Chen YT, Tsai SF. Type II collagen gene variants and inherited osteonecrosis of the femoral head. N Engl J Med. 352(22):2294-2301, 2005. Huang SF, Liu HP, Li LH, Ku YC, Fu YN, Tsai HY, Chen YT, Lin YF, Chang WC, Kuo HP, Wu YC, Chen YR, Tsai SF. High frequency of epidermal growth factor receptor mutations with complex patterns in non-small cell lung cancers related to gefitinib responsiveness in Taiwan. Clin Cancer Res. 10(24):8195-8203, 2004. The International Chimpanzee Chromosome 22 Consortium: Watanabe H, Fujiyama A, Hattori M, Taylor TD, Toyoda A, Kuroki Y, Noguchi H, BenKahla A, Lehrach H, Kube M, Sudbrak R, Taenzer S, Galgoczy P, Platzer M, Scharfe M, Nordsiek G, Blocker H, Hellmann I, Khaitovich P, Paabo S, Reinhardt R, Zheng HJ, Zhang XL, Zhu GF, Wang BF, Fu G, Ren SX, Zhao GP, Chen Z, Lee YS, Cheong JE, Choi SH, Wu KM, Liu TT, Hsiao KJ, Tsai SF, Kim CG, Oota S, Kitano T, Kohara Y, Saitou N, Park HS, Wang SY, Yaspo ML, Sakaki Y. DNA sequence and comparative analysis of chimpanzee chromosome 22. Nature 429: 382-388, 2004. Chen CY*, Wu KM*, Chang YC, Chang C-H, Tsai HC, Liao TL, Liu YM, Chen HJ, Shen Arthur BT, Li JC, Su TL, Shao CP, Lee CT, Hor LI, & Tsai SF. Comparative genome analysis of Vibrio vulnificus, a marine pathogen. Genome Research 13: 2577-2587, 2003.